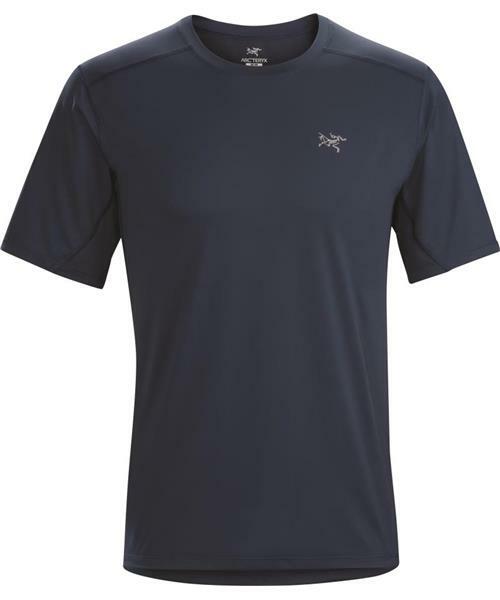 Designed for a range of high output aerobic activities, this technically elevated short sleeve shirt combines performance materials and intelligent, motion focused design to deliver air permeable, moisture wicking comfort on fast paced training days. The Athletic Fit lies close to the body for maximum fabric effectiveness with minimal bulk, and articulated patterning and gusseted underarms provide freedom of movement. The hip length hem provides added coverage. Arc’teryx uses Hybrid Mapping technology to place two distinct materials in the areas where they will deliver the greatest benefit. Helius™, a durable, light, comfortable polyester knit, is used in the body. Fast drying with a moisture wicking finish to promote evaporation, Helius™ has the performance of mechanical stretch and a UPF 50+ rating for sun protection. Viente™ mesh is employed on the back and shoulders for added air circulation. Strategically placed flatlocked seams eliminate irritation during extended active use.